Matcha is an ancient Japanese green tea which has been a part of Zen Buddhist culture for many centuries, originating somewhere between the 7th and 10th centuries. Originally, matcha was only produced in small quantities for the Shogun warriors and nobility. Eventually, matcha tea was also given to the common people, and finally after many years, matcha tea has now found its way to the states. Matcha is a specific variety of shade grown, Japanese green tea that is ground and infused into water rather than steeped like traditional green tea. With regular green tea, after the tea leaves are steeped, they’re discarded. With matcha, you’re drinking the actual tea leaves. A person would need to drink 10 cups of traditional green tea to match the potency, antioxidants, and nutritional benefits of one cup of matcha. Matcha is an extremely potent antioxidant. The ORAC test, developed by the US Department of Agriculture to determine the antioxidant value of different foods, has confirmed that matcha has far more antioxidants than pomegranates, blueberries, or kale, by an incredible amount. Matcha also is a great source of L-theanine, an amino acid that helps with reducing stress and anxiety. Not all matcha is created equal however, and it’s important to choose a quality brand to ensure the best product, for both the sake of taste as well as nutrient content. 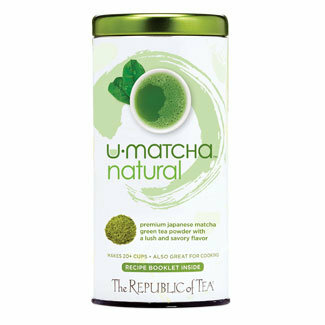 One we particularly love is U-Matcha by Republic of Tea. With matcha being a powder that needs to be mixed with water, it is not particularly conducive to using on the go. Republic of Tea also has a nice matcha combination that is available in tea bags called Double Green Matcha Tea. It’s a mix of organic Chinese green tea leaves and Japanese matcha, so it’s a handy one to take to work or keep in your purse for tea when you’re out. If you’re a tea drinker (or even if you aren’t! ), I’d really recommend giving matcha a try!